When I was a youngin,’ I once went to a summer camp. The camp was located on a college campus and close by was a Jamba Juice. So most days (during the few weeks we were there), I and some of the other students would go to Jamba Juice for smoothies and a scone for breakfast. My favorite smoothie was the (now discontinued) Orange Berry Blitz. 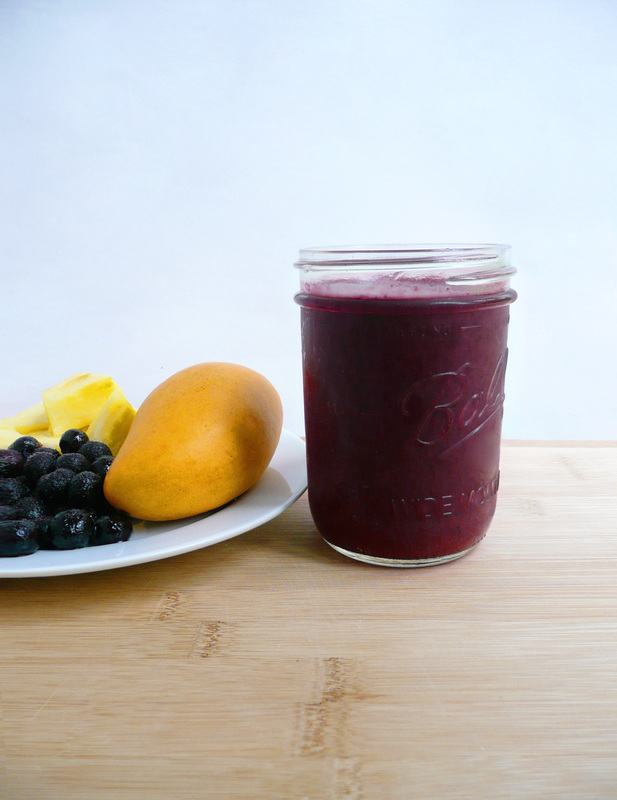 I loved how the orange juice gave the blueberries and pineapple smoothie a wonderful brightness. It’s funny how food and flavors can sometimes take you back, and suddenly, there you are again, cocooned in a marvelous memory. I smile now just thinking of how happy I was that summer, and and this berry smoothie is still the perfect thing to drink on a nice summer day. This is my version of that glorious smoothie. I added mango because I think that it gives the smoothie a little more of a tropical flavor (and an extra little bit of sweetness as well). Feel free to play around with the ingredients. Sometimes I replace the apple juice with water, or add in a few handfuls of baby spinach (if I want to get my greens in for the day without having to give it too much thought). Make the smoothie that you want to drink (though I will say that this smoothie is pretty awesome as written) and have fun! 1. Add all ingredients into a blender and blend until smooth. Serve immediately. 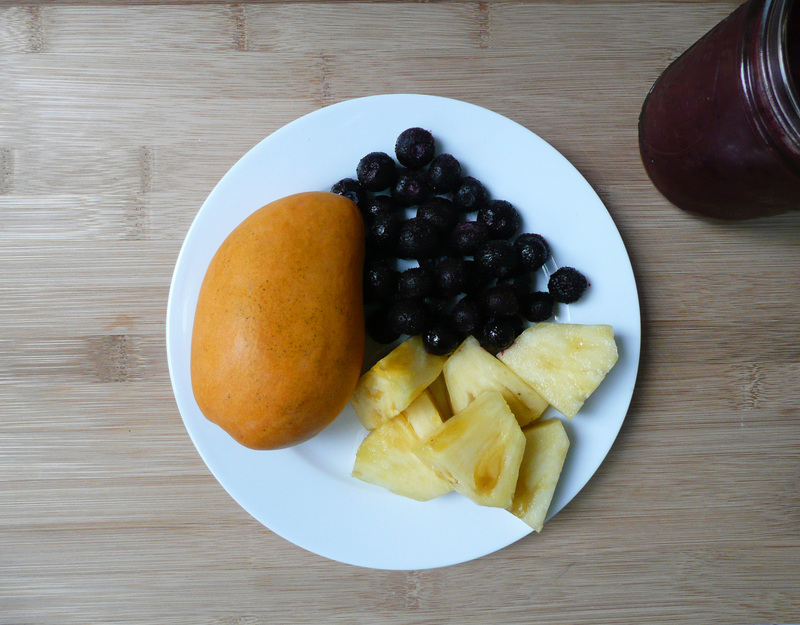 This is what the plate of fruit looked like after I added the fruit into the blender. I think that it’s quite beautiful in a wabi-sabi kind of way. I hope that you have many happy summer days drinking smoothies with your loved ones. This looks amazing!!! I grow my own blueberries and love trying new things with them. Thank you! Lovely . . . 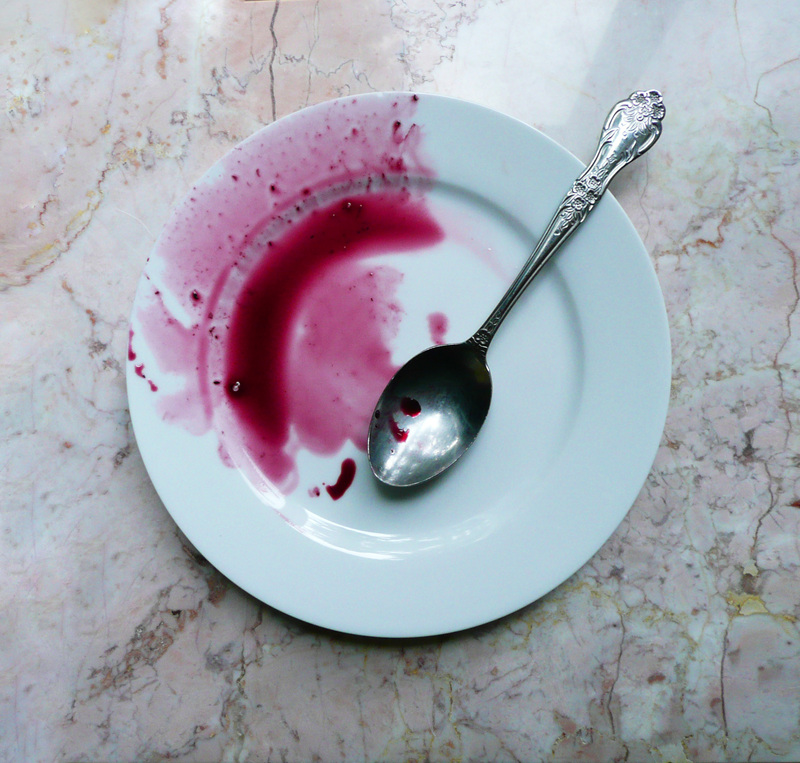 The picture of the plate looks very artistic. Must be yummy and refreshing!